Rogue Marshal is a complete role-playing game, powered by the FateStorm system, published by Broken Tower. Rogue Marshal – Ascendancy focuses on the stories of a nation’s citizens looking to break out of the traps that Ashendrya, also known as the endless city, surrounds them with everyday; whether political, social, cultural, racial or physical, and the easiest way they can do this is by becoming a Rogue Marshal; fulfilling warrants, gaining fortune, fame and maybe even a semblance of freedom. It is a dark, punk-goth, fantasy game set in a world that has grown out of the loss of a living deity and the gaining of a mad god. Ashendrya is the capital and heart of the nation called Nebezzenatt. It is a city the age and size of a nation unto itself, broken into enclaves and ruled by industrial cabals– the nation’s citizens are left to fend for themselves; or join the cabals for a measure of protection at the cost of their liberty. 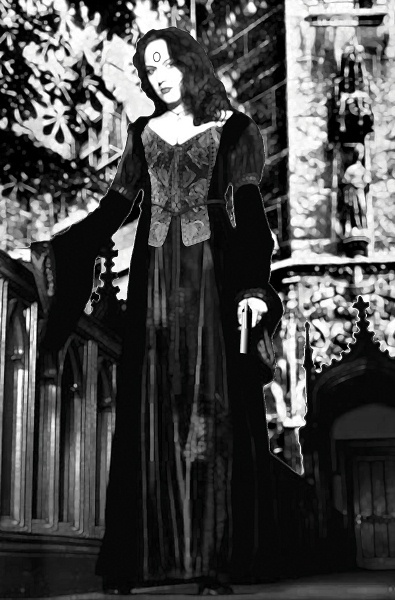 Cabalist wearing gala gown and carrying an amarette pistol. She is imbedded with an Aphoro lobering in her forehead. All accoutrements from the House of Yvette. 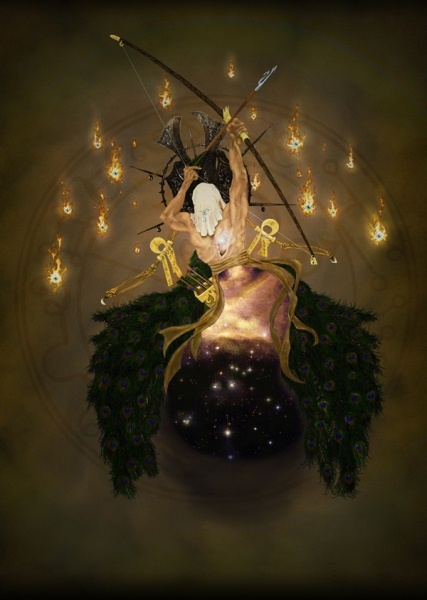 The society of Ashendrya values fashion, reputation and brand identity as all-powerful factors; master craftsmen are seen as heralds of a new dawn and their goods are coveted as the ultimate status symbols. The cabals, looking to expand their influence into other regions of the city not under their control, hire vigilantes to hunt down rippers or gladiators to fight in the arenas, while wearing the cabals sigil or using cabal manufactured equipment. Like modern athletes in our own world, sponsored by major corporations, it is hoped by the cabals that the success and street credentials of these individuals, promoting the cabals will raise their influence with the public and regional officials. The flip side to this promotion of rare and expensive clothing, armour and weapons, include gangs of ‘oscallions’, those without the financial means to buy these coveted goods, resort to murder and theft to gain the latest fashions or fads. And in the endless dark of the cities claustrophobic alley ways and tunnels serial killers known as ‘rippers’, whose motives and methods are as individual as the regions of the city, stalk with near impunity. The cabals protect only what they own and the rest is left up to the Kabar; a bloated civil bureaucracy, that teeters on the brink of collapse and is undermined by the cabals at every opportunity. Establishing a judiciary within each region, in the form of a Justicar, the Kabar maintains social order only through the hiring of normal citizens –Rogue Marshals– to act as a defacto police force. These men and woman swear an oath known as the Iron Charter; allowing them a measure of impunity in carrying out a national warrant, swearing to serve the nation’s interests. While many Rogue Marshals are little better than criminal thugs themselves, others are desperate citizens looking for a means of raising themselves out of the ranks of the impoverished and destitute. They face the threats that the Kabar lacks the manpower to resolve and those the cabals ignore; rippers, degenerate cultists, man-made chemical or mechanical abominations, revolutionaries and saboteurs, and even manifestations from beyond the grave and borders of reality. Whether they know it or not, the Rogue Marshals are the thin red line binding a city and a nation from falling into oblivion. Rogue Marshal was developed as a proving ground for the FateStorm game system, over the course of more than ten years, while the world in which Rogue Marshal takes place had been in development for more than twenty. I wanted to really explore the full extent of the system in an extreme environment where I could keep the players’ focus. Playing in Ashendrya gave me those options. Some people have described it as a sandbox city, because regions within the city (acting almost autonomously and jealously guarding their borders) rise and fall and the city is in a constant state of flux. This means that there are regions that have been left in ruins as well as those regions bustling with commercial, political and criminal activity. The city was built on the bones of older cities and towns and the gaps in-between these settlements eventually filled in to become an urban sprawl unlike anything else on the planet. However, I also wanted a game that explored aspects of our own culture, the modern commercialism and cult of brands, the willingness to sacrifice personal liberty for the sake of the illusion of safety and comfort and the loss of social cohesion through the glorification of the individual and self promotion. In terms of technology, I took the 16-17 Century as my guide as I wanted to explore the rise of science against a background of spiritual belief; this fits well with the FateStorm system. I also wanted a conflict between magic and moderninity; which gives rise to the external conflicts the nation faces with other political and cultural influences in the world. With a project that spanned so many years, it is difficult to pinpoint the influences that started it all, but the development of the FateStorm system was a major influence. Looking at the setting in isolation, I think the greatest influences were authors. Shadow of the Torturer by Gene Wolfe was certainly a major influence and that can be seen in the development of Ashendrya, in its layers: historical, political and physical. H.P. Lovecraft was also a major influence in the more otherworldly aspects and the darker side of the setting; with the influences of the mad god– Shiok– and manifesicants (extra-dimensional creatures) being summoned into the city by cults and revegaites (practitioners of outlawed mystical arts). Finally, China Mieville, while a late influence was no less important, Perdido Street Station and The Scar really forced me to push the limits of a city and society that struggles to stay together despite all the odds. His love of political dissent and personal manifestos greatly influenced the ideals of the Rogue Marshals, the politics of Ashendrya and the festering wounds hidden in the city’s streets. William Gibson was another influence with regard to the social issues in the setting and the idea of individual liberty, responsibility and reaction to social and cultural trends. Lastly, my love of history was a great influence. I found myself drawn to the wars of the Renaissance and the Napoleonic era with regard to many aspects of the setting, including the type of warfare the nation is currently engaged in, a military elite, the use of levies and penal troops to fight the nations wars and the sense of old glories maintained at societies expense. Reading, lots of reading. Certainly, also, through years of playing other games, there is inherited research that comes through exploring other games; both systems and settings. I read a lot of books about cities and the formation of settlements, City of Quartz (Mike Davis, Odonian Press, 2001) was one of those, describing the establishment of Los Angeles and its growth into the 20th Century. Books on religion and architecture, warfare and even sanitation (although I can’t remember that book’s title). For the system, I read a lot of articles and books, Jung and Campbell, but also books on various magical traditions and ancient astrology (especially from the Egyptian traditions); and these have had a large influence on the FateStorm system with regard to the types of archetypes, and the idea of the HeroCycle and FateSphere. The Renaissance at War (Thomas Arnold, Cassell history of warfare, 2001) was a constant desk companion during the setting development, both for imagery and historical reference. 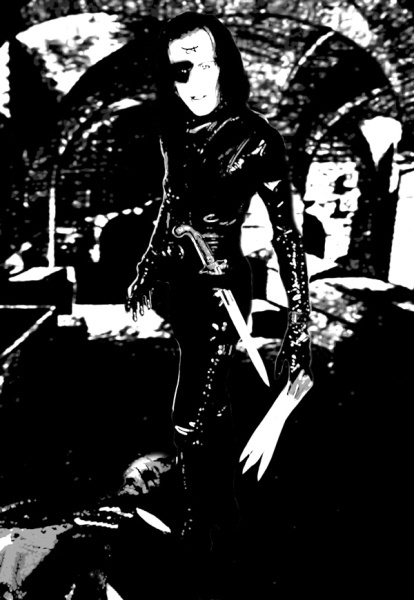 The ripper known as Spike terrorised the regions of Thelfen, Cadriss and Belen for more than twenty years before he was hunted down and killed by Cabal Renfiel’s nominate, Attrition. More than 300 bodies were recovered from Spike’s lair, although he was held responsible for 1104 murders. According to his mother ‘spike’ had been the name of his pet dog that their neighbours had killed and eaten when he was a child. The art could be best described as dark and menacing. The images were mostly hand drawn and inked, or hand painted, before being scanned in and digitally manipulated; although some were completely digital. Most are a mix of out-of-focus or gauche painterly style, which gives a subtle, yet disturbing, quality to them – as if there are things on the edge of the vision, important details that require the viewer to find them, rather than present themselves overtly. This reflects the setting: much is not what it appears to be and much remains beyond the immediate attention of those who live in the endless city.Many of the images have a sense of faded grandeur to them. In this world, while there is wealth and glitter, it is eventually squandered and fortunes wither. The focus was also on individuals not necessarily on scenes as the real strength in the setting comes not from grand, world-spanning hero-sagas, but in the grit and anonymity that the endless city forces upon the individual and that the individual strives to escape. 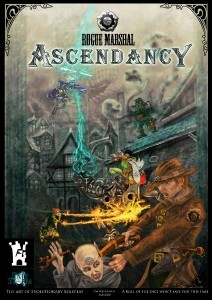 Rogue Marshal – Ascendancy is a mix of a Lovecraftian horror tale and a Machiavellian thriller. The gaming experience is grim, claustrophobic and foreboding. Those groups that enjoy John Grisham style plots, swashbuckling high-jinks and steampunk revolution will also find the setting ready to accommodate them. Because of the FateStorm system, the games focus on the stories of the avatars over the stories of the city, but also the stories of the avatars become the stories of the city. In such a tight setting the use of the HeroCycle is a great asset as it can really highlight the plight of the avatars and force them to take actions that push the story in new directions as well as let them have moments of glory. Even when avatars feel like they’ve made it off the street and can start mingling with high society, there is an underlying sense of doubt and that it is all about to come crashing down around their heads. So, paranoia can also be a major factor as well. I would compare Rogue Marshal to SLA Industries and Cadwallon. SLA Industries is much more sci-punk, but there are thematic similarities between the industrial world of Mort and the sprawl of Ashendrya; the idea of individuals taking on the role of social protectors and mediators, of fame being looked upon as the heights of social achievement. The claustrophobic, darkness that waits to engulf avatars who make the slightest mistake is another similarity that the two settings share. I think SLA Industries drives home the madness and horror of Mort far better than Rogue Marshal does of Ashendrya, but Rogue Marshal provides a much more focused approach to the stories of the avatars and the trials and struggles that they face beyond their work as Rogue Marshals. Cadwallon is an amazing work of gamecraft, the detail and structure of the city is a joy to explore and I would love to be able to develop more guides to Ashendrya in a manner similar to that of Cadwallon. But while Cadwallon has more setting description and notation, Rogue Marshal has greater story development through system integration beyond the regional modifiers that are present in Cadwallon. I don’t think either game has the same sense of personal engagement that Rogue Marshal offers in that the avatars are often forced to put it all on the line – not just physically but socially, culturally, politically and even mentally, and this has a lot to do with the system integration with the setting. In 2003, I held a finished draft of the first FateStorm book, which was 207 pages (compared to the final product’s 310 pages). That first draft was a culmination of years of previous campaign material from a number of continents on the same planet (Thear). When I finished that draft I realised that as a vehicle for the FateStorm system it was too broad with not enough focus on the details that go into making great stories. Moreover I could not possibly do justice to all the work I’d done in developing these various parts of the world – the stories, maps, NPCs and creatures – and still have a commercially viable end product. So I narrowed my scope. Having started off at a macro level, with a world map of Thear, individual continent maps and regional maps where previous game tests and campaigns had been held, I decided that I wanted to look at a part of the world I’d never looked at before and really build it up to be the essence of all those other tests and campaigns – and so the nation of Nebezzenatt was born, on the northern coastal marches of Rhythlys; and at its heart Ashendrya. With all the previous history, cultural and political, I had for many of the surrounding regions of Rhythlys, my focus was on blending the history, political standing and technology of Nebezzenatt into those surroundings but also at every stage pushing points of conflict. These conflicts not only to give rise to the stories of Rogue Marshal, but also act as anchors for the avatars to relate to the world around them in a visceral manner. Whether it is political, physical or spiritual conflicts the environment of Rogue Marshal forces actions of consequence on to the avatar. In Nebezzenatt, I wanted a relatively young nation, one that mirrored many of the cultural aspects of colonial America but also industrial Europe and tied all together with an academic approach to the idea of magic and technology, similar to the great minds of the Renaissance. I also wanted cultural links to contemporary culture: the idea of personal identity found only through fame, the loss of identity in overpopulation, mental illness caused by urban social decay, and loss of liberty via propaganda, fear and reliance upon a governing body for every aspect of survival. Many of these ideas became embodied in the idea of Ashendrya, others in the identities of the industrial cabals, which could be likened to the mega corporations of the cyberpunk genre, and the horror of the rippers. I also wanted there to be a clear economical/political and environmental strata. My reasoning for this was to increase tension and conflict between different elements within the city as well as provide further fuel for story development dealing with issues of social injustice, exclusion, poverty and socio-economic manipulation for personal gain. So I developed the three-tiered city: a term I use to describe both a socio-economic as well as an actual physical manifestation of the strata within Ashendryan society. Lower city: these regions of the city are mostly subterranean, old sewers, mines and excavations that have become domestic and industrial ghettos. These parts of the city are prone to fires, flooding, plagues, and collapses and are rife with crime. Middle city: mostly built from the ground level up, it is the place of the common people. While most of the middle city suffers from overcrowding and pollution, the populace of the middle city at least enjoys an hour or two of direct sunlight a day, the protection of wardens and access to public amenities. Upper city: built over the top of the middle city the upper city is the world of the rich and powerful. Much of the upper city is connected via bridges and walkways, even carriage ways that mean travel to the lower levels of the city can be avoided; and when there is no other choice, hot air balloon or airships ferry those who can afford their services direct to their lofty destinations. Within the upper city there are parks and gardens, even forests, all built on top of the middle city below. Protected regions are regions that have protection either from a cabal or the nation government. Public regions act like mini democracies and are typically run by voted civil servants, but many such regions fall prey to cabal sympathisers, criminal leaders taking on an air of respectability or nepotism. Pit regions are the poorest and most vulnerable regions in the city. Often held to ransom by local gangs and criminals, few pit regions are better than slums. With so many aspects coming into play, I knew I wanted the players to have the option to take any path they wanted; whether cabal, proletariat, Septnarok or freeman – but I’m a big fan of unifying the party, giving them something which they all share, even if they are at odds in all other aspects of their lives and characters and so I decided to focus on the Rogue Marshals. This story tool meant it was easy to initiate stories in which all the players could participate either on an ongoing or ad-hoc basis. 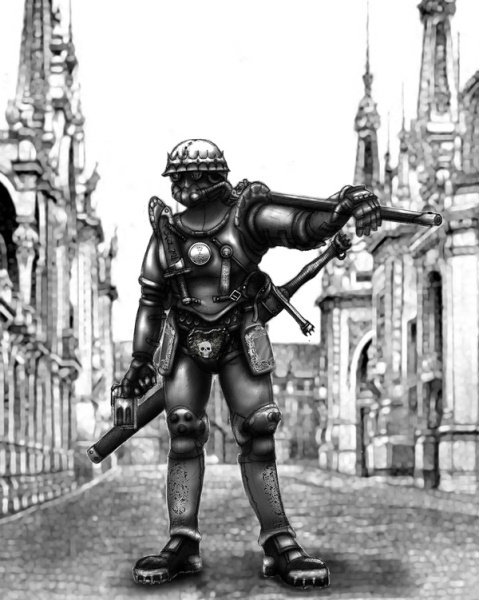 As the Rogue Marshals are volunteer and only take what warrants they chose, the players would be free to pursue any other goals their avatars would have in the endless city or beyond. The Fate could arrange stories in an increasing level of difficulty that made narrative sense; the justicars handing out lesser warrants to novice rogue marshals and leaving the five skull warrants for the hardened marshals. The act of becoming a Rogue Marshal immediately highlights the avatars as motivated and unique individuals, and the stories and warrants that they pursue would be quite capable of leading them to all levels of the city whether the physical or social, where their actions can have a very profound and noticeable result, at a local and national level. The Infinitesimal Jester, the embodiment of fate in the FateStorm multiverse. Getting back to the wider setting, Rogue Marshal has playable races that are setting specific and were designed with special attention to the FateStorm system. Each of the five non-human races represents one of the cardinal elements that form a core component of the FateStorm system design. So you have: Avnastrumn (Air), Paen-Eohlythid (Assea), Nazagh (Fire), Syrana (Water), Taraen (Earth). Apart from these races, the players also have the option of playing human or Septnarok (Mountain clan folk). The non-human races have a strong link to the historical events surrounding the loss of the living deity (Eohl) and the extinction of the DaiShei’An (godchildren), but they have also evolved since those times to develop their own unique cultures, cultural interactions with humans and each other and these additional conflicts and interests drive further avatar and story development. Bringing all these elements together, fitting in all the detailed information I wanted and ensuring the information conveyed the feel and spirit of the setting was never going to be easy; by the time I had a new draft printed I had close to 400 pages. I like to give players and the GM everything they need to play, I don’t like the idea of forcing players or GMs to buy separate books just to play the game, so cutting the draft down was a real challenge for me – but it was just way too big. The first casualty was the section on designing and building technological items. Later, this became the first supplement Rogue Marshal – Steam and Steel, and is a really nifty little book, but it wasn’t necessary to play the game. Next to go was a fair amount of historical setting information as well as a geo-political overview of the rest of the continent of Rhythlys and the world. I also removed more detailed information on the city of Ashendrya and specific regions within the city. My first reader, my wife, argued that even more could have been taken out, and maybe that’s true, but I’m happy to give any added value I can. Apart from the art, which was a real struggle to accomplish in development period, perhaps one of the hardest tasks I had in putting the final book together was setting out the chapter order. In a game like Rogue Marshal, with a system like FateStorm that integrates so deeply with the setting, it was a juggling act to ensure that all relevant information was conveyed in a sequential manner that made sense, as well as to deliver the information in an entertaining way. 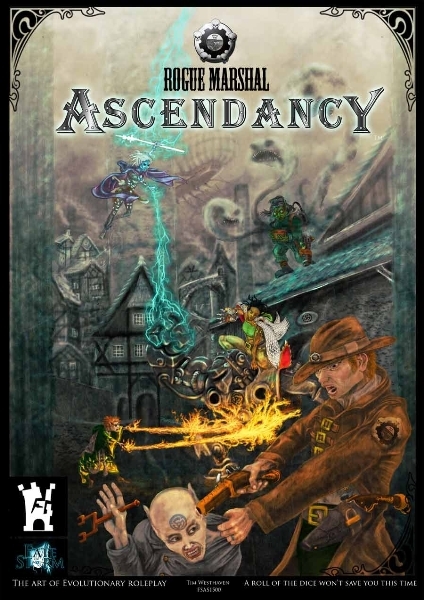 It has been over a year now since Ascendancy-Rogue Marshal was published and, having recently bought out a new game in the FateStorm system, I’ve learned a lot since then. I think Rogue Marshal is going to get a lot of TLC in the near future. I’ve already got a number of supplements and stories (modules) planned and so it’s more about the time it takes me to get them done rather than if they will see the light of day. It’s a really vibrant and immersive setting and one which I always love returning to, with so much unpublished material waiting in the wings I’m keen to see the plot thicken.